Greenpointers has a report on a proposed rezoning for the block of McGuinness between Calyer and Greenpoint – aka, the “Blockbuster” site (remember Blockbuster? back in the 20th century they used to rent movies), across from Key Food. CB1’s Land Use committee held a hearing on the project last week (which I missed), and the full board will presumably vote on the application at this Wednesday’s full board meeting. 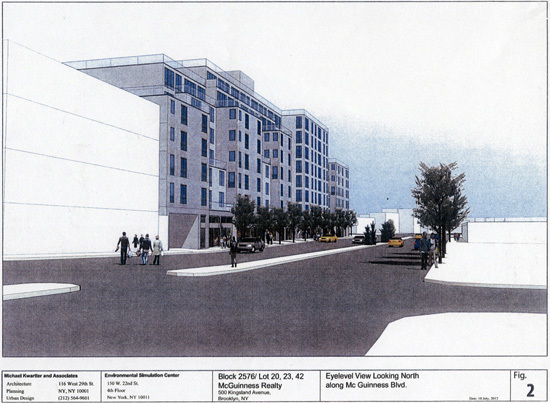 The proposal itself is to rezone this block of McGuinness from M1 to R7-A (which would allow a building of the scale depicted above – hopefully this zoning placeholder will be developed into something a little insipid design-wise once the rezoning is approved). As Greenpointers helpfully points out, R7-A is the “type of zoning [that] is found along the avenues in the East Village”. It also happens to be the type of zoning that is found along the west side of McGuinness from Calyer south to Driggs (north of Greenpoint Avenue, the west side of the street is zoned R6-A, a slightly smaller medium-density zoning). The blocks from Calyer south were up zoned in 2009 as part of the larger contextual rezoning of inland Williamsburg and Greenpoint (City Planning looks to put higher density residential on avenues in part to encourage commercial development and in part make the use of inclusionary housing bonuses more viable – and yes, this application includes an expansion of the inclusionary program to this block). This particular site was left out of the 200-block 2009 rezoning only because that rezoning focused solely on height limits and did not involve any use changes. Had the 2009 rezoning allowed change of use anywhere, it probably would have allowed it here (the owner of the property had already started the process, at least informally, before 2009). So the main question here is not whether the property should be rezoned from manufacturing to residential like the rest of this side of the boulevard, but whether it should be rezoned to match the medium-density blocks to the north or the medium-to-high-density blocks to the south.